Born in Syracuse, New York, growing up in Baltimore, Maryland where he was a member of Old St. Paul’s Episcopal Church, John ended up in New Jersey during his college years. After serving as a high school science and math teacher and as a lay youth pastor, and starting a family, he earned a Master of Divinity at The General Theological Seminary in NYC and was ordained first as a deacon and then as a priest in 1986. Prior to coming to Christ Church, Reading, John served as a curate, a vicar and a rector with four parishes in New Jersey and the Philadelphia area. 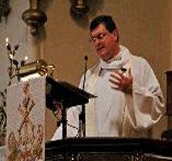 He was called to be rector of Christ Church in December of 2004. He simply loves Christ Church, the City of Reading and Berks County and sees evermore possibilities for expanding the unconditionally loving ministry of Christ Jesus through Christ Church, because its loving congregation is so faithful and talented. John is a long-time practitioner of Centering Prayer and considers himself a contemplative theologian who sees daily the miraculous evidence of God’s active loving presence in all of God’s children and creation. The Reverend Dr. Margaret “Midge” Pendergast is a licensed psychologist with many years of experience in schools and in private practice. 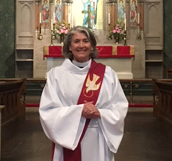 She is an ordained deacon whose role in worship service is to proclaim the Gospel, assist the priest at the Eucharist, and on occasion preach from the pulpit. Her ministry reaches far beyond Sunday services, however. She formed, trains, and heads up the healing prayer team at Christ Church; does pastoral counseling; makes hospital and home visits; counsels grieving families; and officiates at funerals along with Fr. John. The Celtic services are just one of many ways she puts her considerable creative talents to use reaching out to the community with the beauty and warmth of God’s love. She is also quite active in the Diaconate and in regional and national church events.